These Quick Seasoned Nuts are so easy, using just a few ingredients each and made in under 10 minutes. A sweet option and a savory option that are equally delicious. Seasoned Nuts are perfect for the Holidays. They are great to give as gifts or to make for people to snack on at parties. Both of them are so easy, made in under 10 minutes with just a few ingredients. I wanted to do a sweet and savory version because you can’t even go wrong with sweet and there is usually someone that can’t have or chooses not to have sugar. Both of them are naturally gluten free, but also happen to be vegan and paleo as well- in case you are working around any dietary issues. 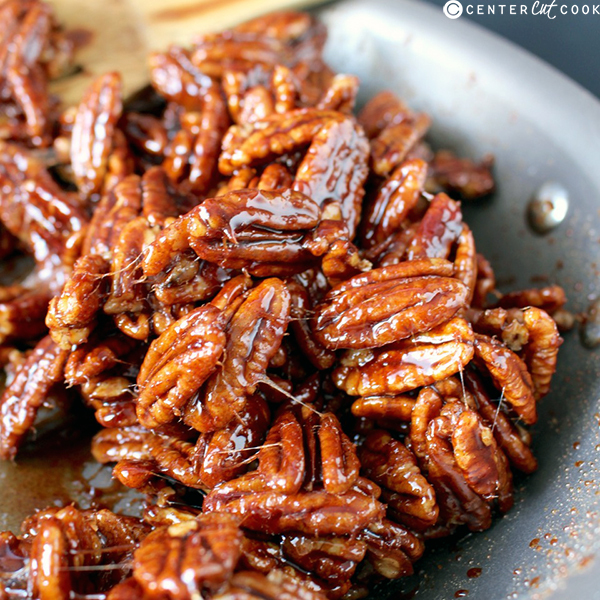 The Maple Cinnamon Pecans are so amazing! They maple caramelizes and it combines perfectly with the cinnamon to create the best treat. They smell like cinnamon rolls as they’re cooking and they taste just as good! They are a little sticky once they’re done, so a light dusting of cinnamon sugar will help with that. 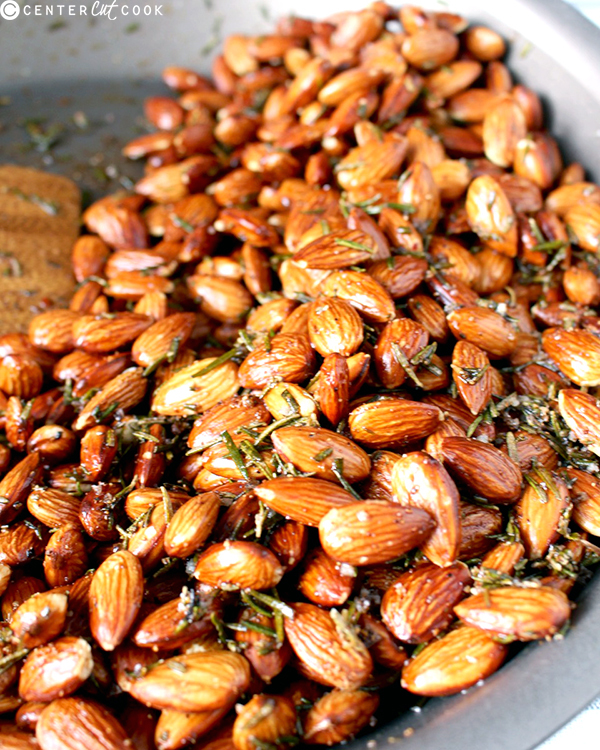 The Rosemary Garlic Almonds are just as easy and such a nice alternative to the sweets that Christmas brings. The freshness of the rosemary makes them irresistible and you’ll find it’s hard to stop snacking on them. These are a favorite of ours and I make them all the time. I used Anolon Advanced Umber French Skillets to make both of these and it was nice to have quick, even heating and the non-stick surface that made cleaning so easy. Whether you use these as gifts, make as a snack for a party, or just eat them all yourself- you will not be disappointed. They are so easy and delicious! Combine pecans, maple syrup, cinnamon, and salt. Heat over medium heat for 6-8 minutes, stirring regularly, until thickened. Sprinkle with cinnamon sugar if desired and store in an airtight container. In a large sauce pan, combine almonds, coconut oil, rosemary, garlic powder, salt and pepper. Cook over medium heat for 7-9 minutes, stirring regularly, until toasted and fragrant. Spread onto wax paper to cool then store in an airtight container.